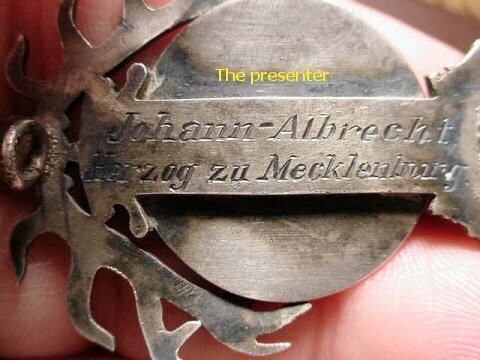 DESCRIPTION: Here is an utterly fantastic medal that was presented for 100 game (deer) kills to Christianus Ernestus, Duke of Stolberg-Wernigerode, by his excellency Johann Albrecht Herzog zu Mecklenburg. 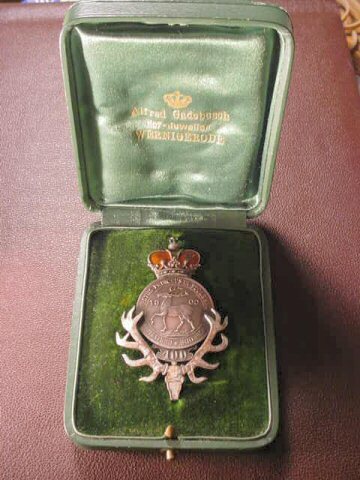 This is in the original green leather, green velvet-lined case and bears the gold letters and crown. 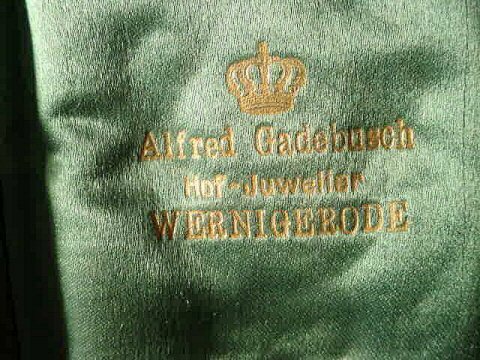 The jeweler was Alfred Gadebusch, Hof Juweller, jeweler to the palace, in Wernigerode. 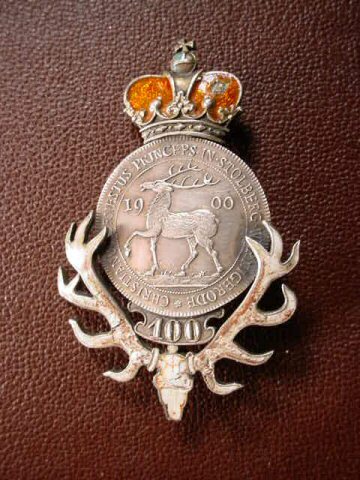 The badge is fantastic with a finely enameled stag skull. 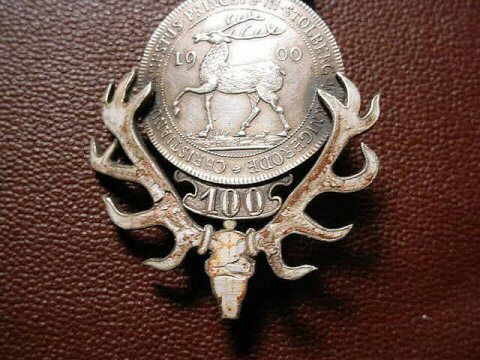 At first appearance it looks like cracks are in the enamel--there are a few--, but the clever jeweler has purposely made the stag horns look rustic and real! 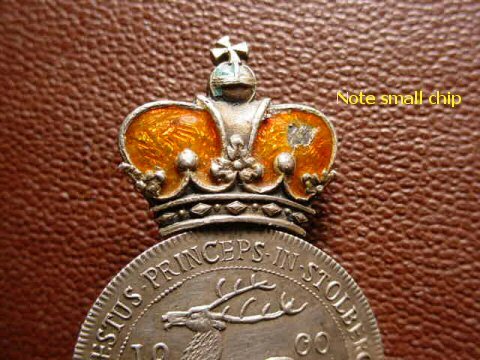 The enamel crown has a small nick, but all in all, the piece is in fine overall condition. Extremely rare and fine. 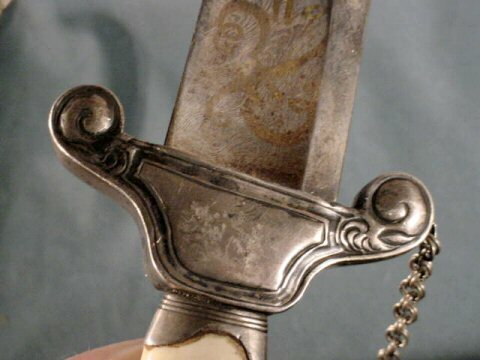 DESCRIPTION: Here is a great German hunting dagger (Hirshfänger) in absolutely wonderful condition with one of the finest engraved presentation blades we have ever seen. 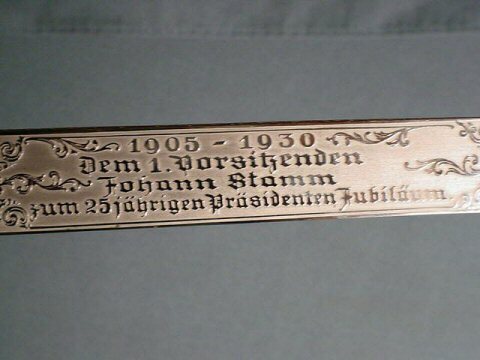 The legend on the front side of the blade recognizes Herr Johann Stamm at a 25-year service as the first president serving from 1905-1930. 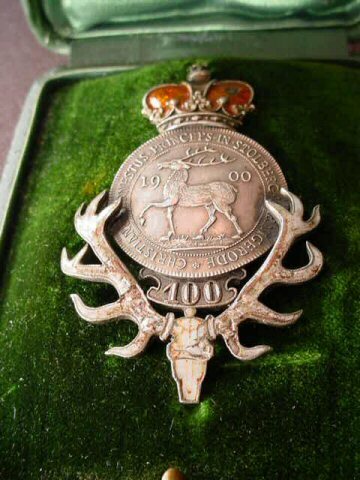 This was presented for his 25-year jubilee. 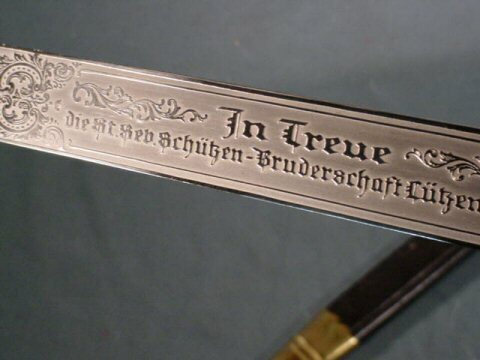 On the backside it expresses that he is given this magnificent hunting weapon for true service to the Saint Sebastian Shooting Brotherhood at the town of Lutzenkirchen. 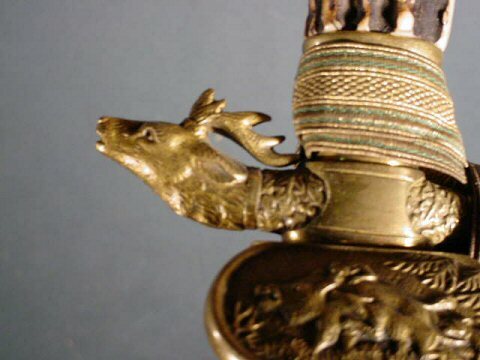 The stag grip and all fittings are perfect and the blade is marked and bright. 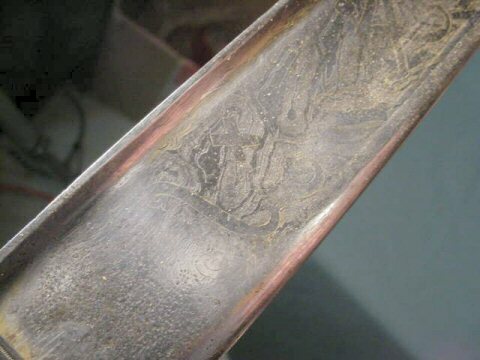 The deep etching with forest scenes are much better than the usual. 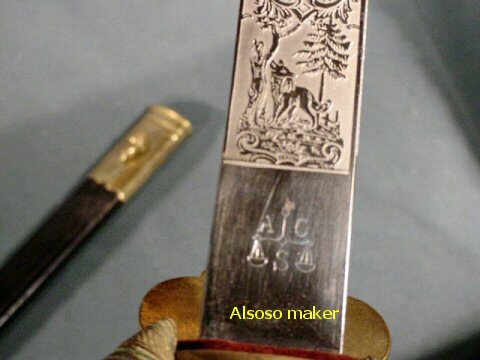 The maker is Alcoso of Solingen. It comes with an original knot or portapee. 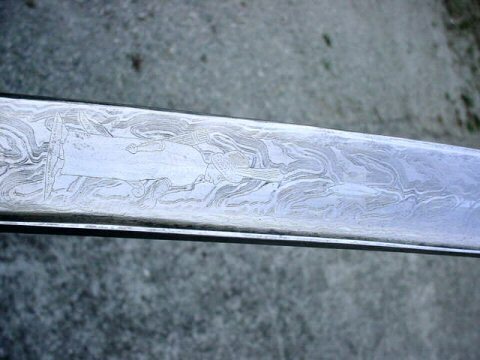 The scabbard is also near perfect. 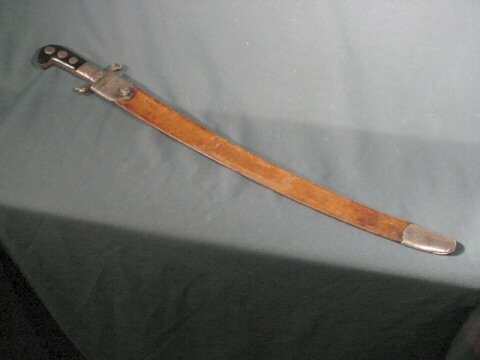 The length overall is 24 inches with the blade measuring 15 ½ inches. This is in magnificent shape considering it is 72 years old. 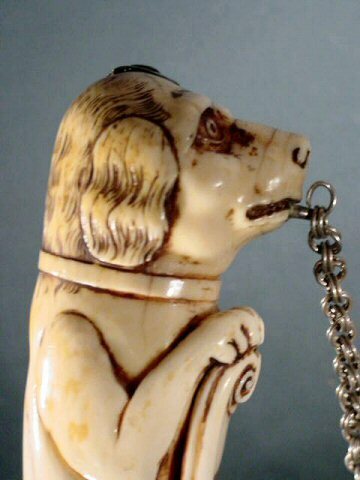 We have seldom seen a specimen as fine as this in museums or private collections. Utterly magnificent! 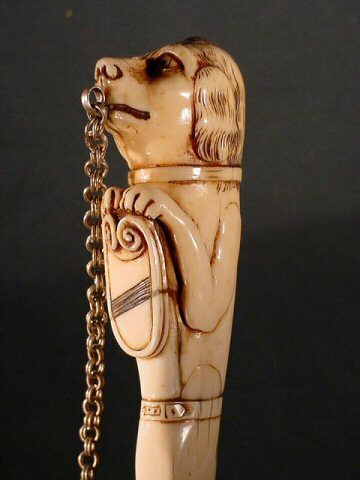 DESCRIPTION: This is a magnificent museum-quality Hirshfänger possibly Austrian with an ivory hunting dog as the central motif that is hand carved. 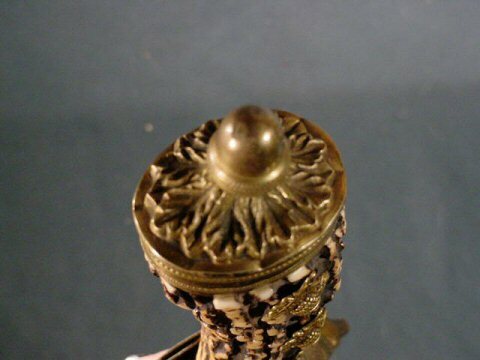 The piece is undoubtedly from the early 1600's. 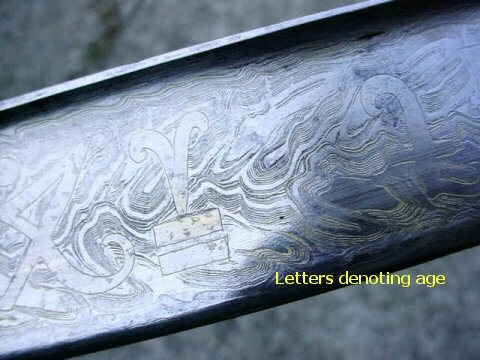 The letters on the blade indicate this in ancient Germanic script. The fittings are in silver. 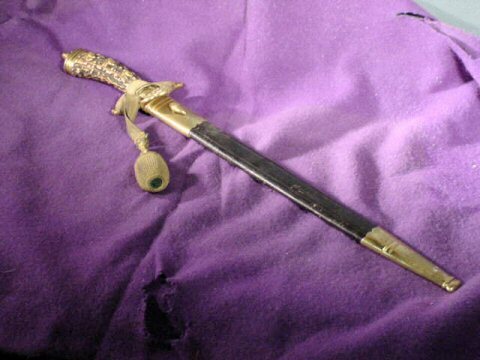 The blade is in fine Damascus that has been difficult for us to photograph. 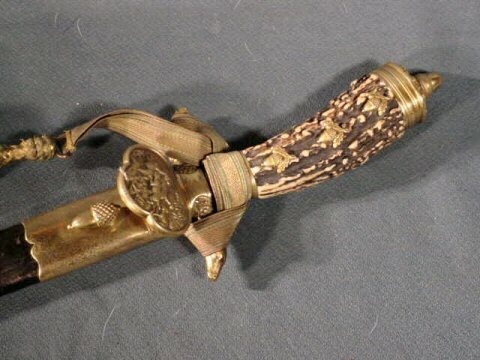 There are designs of weaponry, cannon, pikes, swords, etc., worked into the Damascus blade in gold. 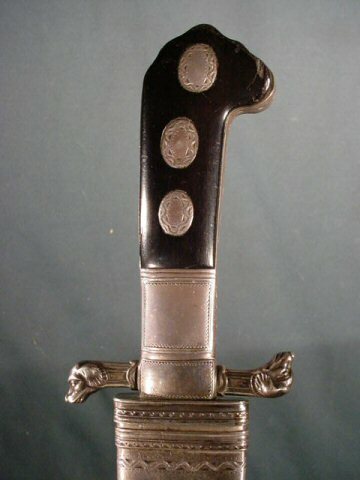 This is the style actually used in the royal hunt and was undoubtedly the favored weapon of some royal personage of the German or Austrian courts. 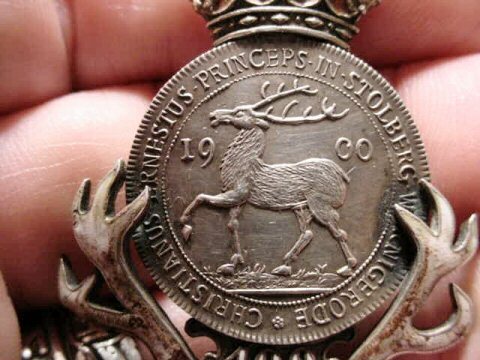 A true museum piece that would grace even the Jagdmuseum in Munich. 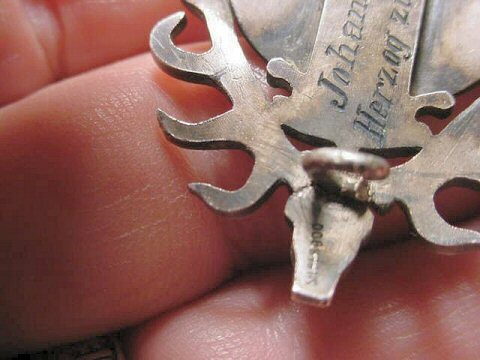 DESCRIPTION: This is an excellent-quality hunting (Hirshfänger) of the early 17th-century style. 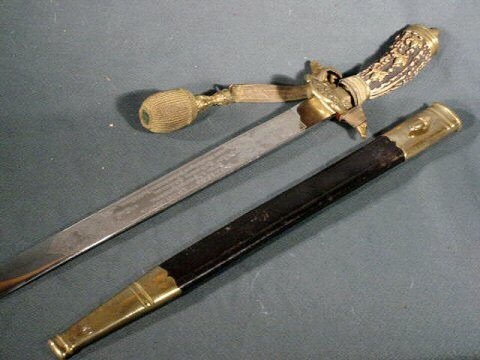 Although the blade is possibly of the 16th century. 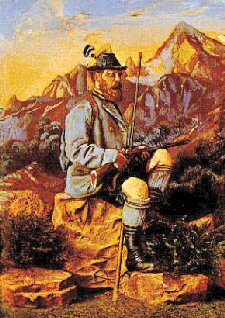 It is in the classical Austrian style as used by kings and princes or at least landed gentries or the minor royalty. 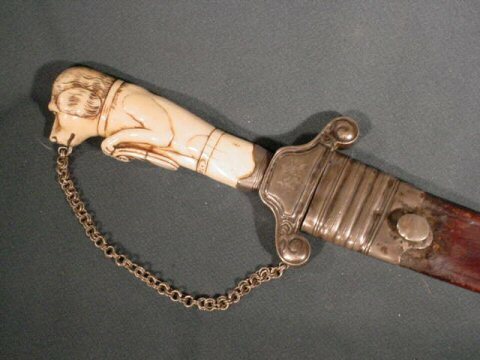 It has a magnificent Damascus blade with various figures and letters worked into the Damascus (an extraordinary feat). 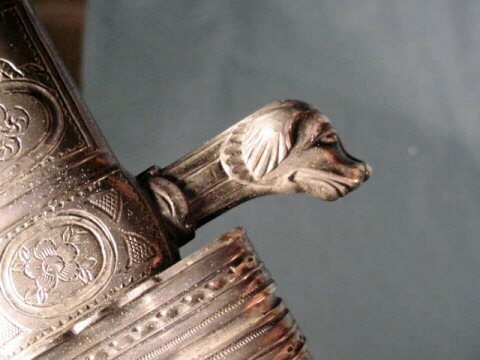 The fittings are silver and hand engraved. 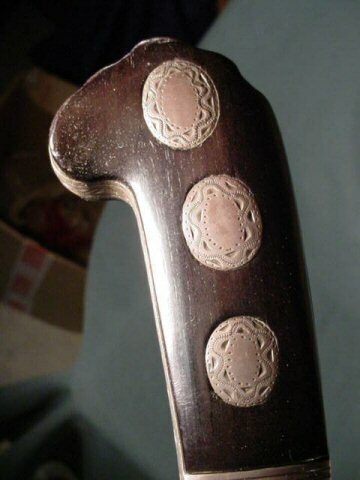 The grip is black horn. 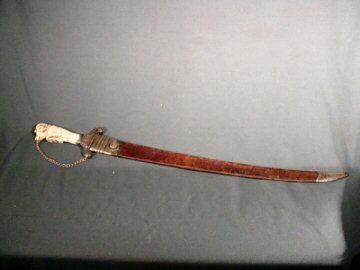 The length is about 30 inches in the scabbard. 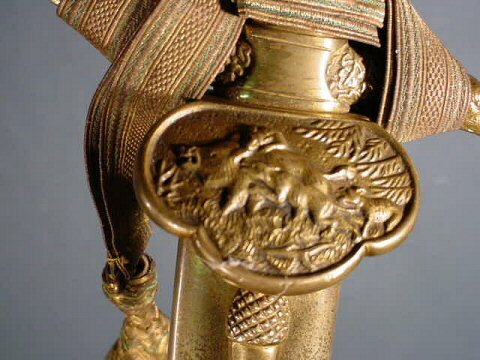 This example is similar to the pieces proudly displayed at the Munich Jagdmuseum. Very fine condition. 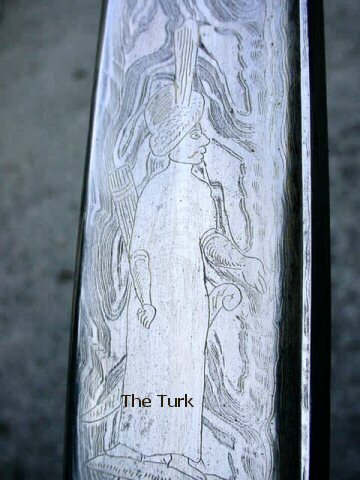 One interesting feature is the Turk that is shown in one of the engraved panels. 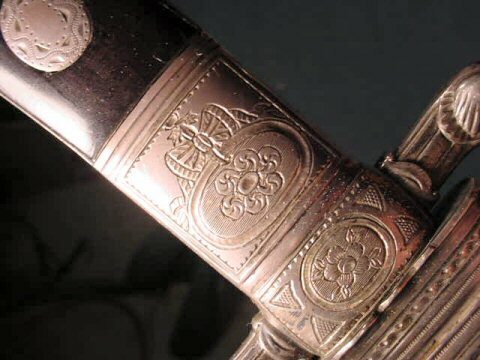 The Turks are depicted on many royal pieces because of the battles that went on for centuries in Austria between the Germanic peoples and these cruel invaders. 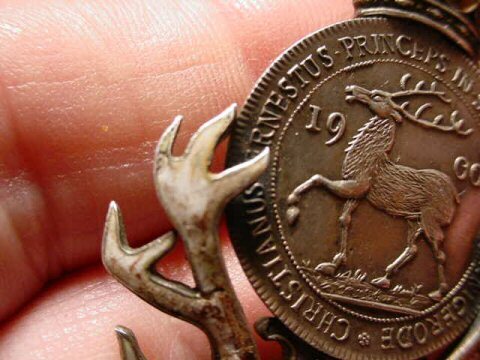 This period is often memorialized on treasured relics. 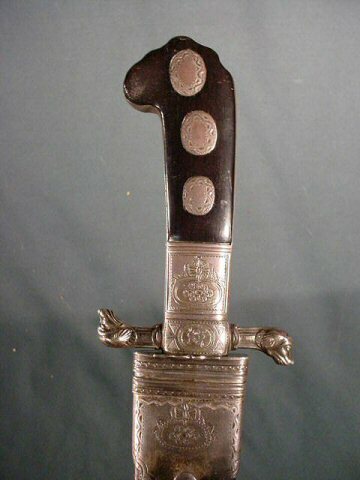 The quality of this weapon is astounding indeed and is a one-time find of great historical importance.